Successfully making the case for a new mobile initiative often hinges on identifying and quantifying expected business outcomes. Why does this matter? Because the estimated cost of designing, developing and bringing your mobile product to market has no context otherwise. Which of these two scenarios would you invest in? Scenario A: "I have a mobile initiative that will cost $300-$500k. I haven't specifically identified how I will measure success but it probably will be a combination of downloads, adoption and ratings." Scenario B: "I have a mobile initiative that will cost $300-$500k. I have identified four KPIs that we believe will enable us to identify improved revenue of $400k/yr and reduced costs of $200k/yr." Scenario A has an unquantified business case--and those things that will be measured aren't business outcomes. Scenario B has a quantified business case with real business outcomes. Easy choice, right? To help you build a strong business case for your mobile product, first we'll explore several common mistakes and then we'll discuss guiding principles for unlocking funding. You: "We're going to build XYZ application. We plan to measure success by getting 10,000,000 downloads!" Mr. MoneyBags: "I don't care. Download that. Go away." Why aren't downloads a good measure of success? If 10,000,000 people really did download my mobile app, wouldn't that awesome? 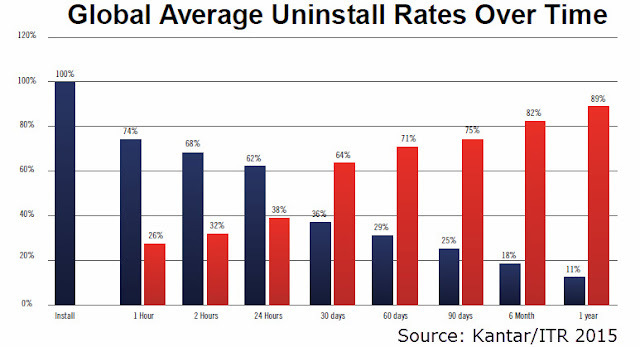 In less than 30 days, 64% of apps are uninstalled. In six months, 82%. While this data varies somewhat by app category, this is the average reality. Clearly, measuring app downloads and installations is not indicative of sustained success! But let's step back: When you first conceived your app you were excited about how you were going to change the world for the better by providing something valuable. What was that value? For example, "if we could enable our customers to access their account using a mobile app, then we think they would do a lot more XYZ." That's your hypothesis. Find a way to test the hypothesis, measure results, forecast "more XYZ"--and then go back to Mr. MoneyBags. You: "We're going to build XYZ application. We plan to measure success by adoption!" Mr. MoneyBags: "I don't care. We're not adopting your idea. Go away." Why isn't adoption a good measure of success? After all, if people are actually using the mobile app, it must be good! Right? When you envisioned your app, how was it going to change the world? What bets did you make in selecting the core capabilities of the app? For example, "If we could enable our customers to send in photos we'd definitely increase our ability to fix their widgets more quickly and less expensively!" To measure whether this capability will actually supporting a desired business outcome--faster, cheaper repairs--perhaps find a way to compare the effectiveness of customer service interactions initiated by the app versus those initiated through the call center. Is money being saved? Are widgets getting fixed in less time? Now you have one hypothesis that can be measured and monitored. Identify several more and then go back to Mr. MoneyBags. You: "We're going to build XYZ application. We plan to measure success by getting a 4+ rating in the app stores!" Mr. MoneyBags: "I don't care. We rate your idea a zero. Go away." Why aren't user ratings a good measure of success? It seems to work for Amazon, right? While app store ratings and, more so, supporting reviews are informative and may surface both app opportunities and bugs, they are not a business outcome. Additionally, a single "1-5" score to rate an app can be extremely subjective. For example, a user may give a "1" for an app with a poor user experience, an annoying bug, for not matching up with a competitor, for not working on their one-in-a-million smartphone--or for nothing substantial at all. While a gaudy "4.5" rating in an app store is exciting to report, what most people are really shooting for is validation that their app works (customer confidence) and is loved (customer satisfaction). There are many other ways to more effectively measure success--even for something subjective like "love"--than user ratings. For example, for a "love" quotient, connect with your Marketing department--they probably already have a number of customer satisfaction KPIs. Find a way to tie into those KPIs. If we boil down the most basic characteristics of an effective KPI it is that we're measuring either an increase in revenue or a decrease in costs. Yes, there many other things to measure, such as application performance and user engagement, but funding decisions are typically made based on clear understanding of financial gain. After all, development costs are real money; your mobile initiative's defining KPIs should be financial in nature, too. The Case For and Against "Peak App"